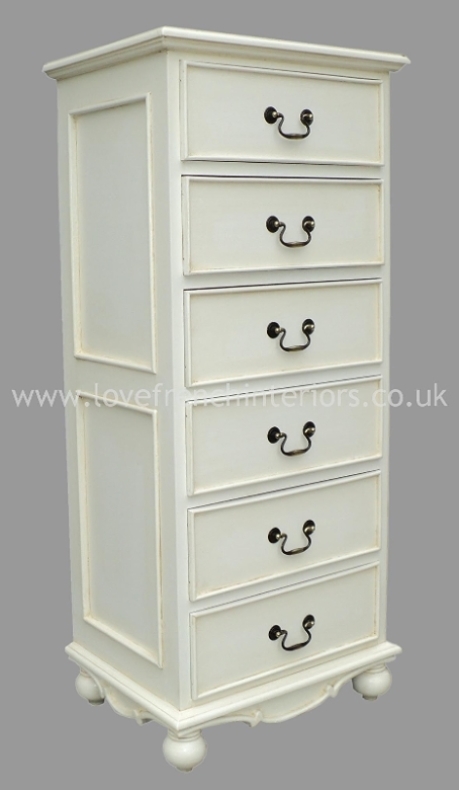 Our Rochelle Star French Tallboy with 6 drawers is finished to order in the UK in the colour of your choice. This 6 drawer tallboy offers plenty of storage space especially where horizontal space may be at a premium. Shown here in Antique White, it can also be finished in Silver, Gold, Noir Black or any other colour of your choosing. You may also select different knobs or handles. Complementary pieces of furniture can be found in our Rochelle Collection. Rochelle Star items are made from recycled wood and medium density fibreboard by the same manufacturer of our mahogany furniture. Featuring solid wooden frames and traditional dovetail joints our Rochelle Star collection offers excellent value for money and is finished in the colour of your choice.